First grown on oak, mahogany and teak logs, the shiitake, also known as forest mushroom and chinese black mushroom, are grown today on "logs" made of wood chips and sawdust. The cap can range in size from 1 to 4 inches, with a meaty texture and a strong woodsy taste. The stem of the shiitake should be discarded, as it is quite tough. Shiitake is among the most widely cultivated of the specialty mushrooms. *Information gathered from "Shiitake: The Healing Mushroom," by Kenneth Jones. 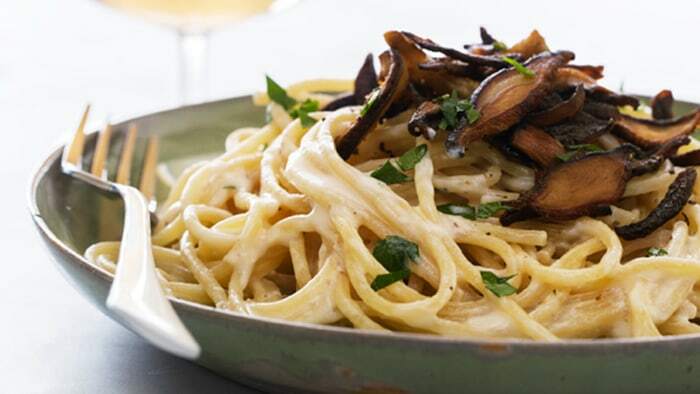 Pasta Carbonara with "Shiitake Bacon"
"Chef Chloe Coscarelli of New York City's By Chloe restaurant makes a delicious vegan version of classic spaghetti carbonara with crispy mushrooms instead of bacon and a creamy dairy-free sauce. "As if carbonara isn't lovable enough for having the word "carb" in it, here's another reason to make it your favorite pasta. The creamy, indulgent sauce is made from healthy, high-protein tofu, but it tastes like it has all sorts of dairy products in it. Top it with shiitake bacon (simply thinly sliced roasted shiitake mushrooms with olive oil and sea salt) and it's the perfect bait for your long-term mate! If the sauce thickens too much as it sits, reconstitute the pasta by adding a little water or nondairy milk. Stir over medium heat until smooth. Adjust seasoning again to taste." For the pasta carbonara: Bring a large pot of salted water to a boil. Add pasta and cook according to package directions. Drain and return to the pot. Meanwhile, heat oil in a medium skillet over medium heat. Add onion and let cook until soft. Add garlic and let cook a few more minutes. Remove from heat. In a blender, combine onion, garlic, tofu, water, lemon juice, and salt. Process on high until very smooth, about 2 minutes. Add sauce to pasta and toss to coat. Season with pepper and add more salt to taste. Let pasta sit for about 5 minutes to allow sauce to thicken slightly. Top with Shiitake Bacon and parsley and serve. For the Parmesan topping (optional): In a food processor, combine almonds, nutritional yeast, and salt, and process until a fine meal forms. Drizzle in maple syrup, and pulse until incorporated. Top pasta with Parmesan topping if using. Note: Use this as a topping on pastas and pizzas, just as you would with Parmesan cheese. Store in the freezer up to 6 months and use as desired. Recipe reprinted from "Chloe's Vegan Italian Kitchen: 150 Pizzas, Pastas, Pestos, Risottos, & Lots of Creamy Italian Classics." Preheat oven to 450 degrees. Blend eggs, milk, salt, pepper, thyme and flour. While whisking, drizzle in melted butter. Transfer to greased and preheated popover or large muffin tins, filling half-full. Bake at 450 degrees for 20 minutes, reduce heat to 350 degrees and bake 15 to 20 minutes, or until batter has puffed up and turned golden brown. Meanwhile, prepare sauce. In a medium saucepan, combine mushroom soup and wine or chicken stock. Stir in turkey and mushrooms. Bring to a simmer on medium heat. Cook until turkey is warmed through, 5 to 10 minutes. To serve, place popover on plate and split open. Ladle the topping into the popover. If desired, garnish with a few sprigs of fresh thyme. This recipe comes to us from Aaron Raverty, OSB, of St. John's Abbey in Collegeville, Minnesota. Cover beef stew meat (or cubed steak) with flour (shake ingredients in a paper bag). Fry in vegetable oil or olive oil until lightly browned on the outside (this will help to keep the meat moist and juicy). Put browned meat into a large kettle, and add the onion, garlic, and mushrooms. Combine all the remaining ingredients (EXCEPT the sour cream) under low heat, stirring constantly; then increase heat until mixture just begins to boil. Return sauce to simmer, and cover kettle. Cook for AT LEAST one hour, stirring mixture occasionally, and taste-testing to adjust ingredients. Add some salt to another kettle of water, and bring to a rapid boil. Add sour cream to sauce about 20 minutes before serving, stirring it in well, and increasing heat slightly. Leave sauce uncovered at this point. Cook pasta according to package directions until al dente; drain and rinse with hot water. Spoon sauce generously over pasta on plates, sprinkle with Parmesan Cheese, and SERVE. Preheat oven to 325º. Dredge fish fillets in cornstarch mixture. In a large nonstick skillet, over medium heat, heat 1 Tbsp. of the oil. Brown fish on both sides; transfer to a roasting pan; bake until center is opaque, 6 to 8 minutes. Meanwhile, add remaining 1 Tbsp. oil to skillet; add mushrooms, bell pepper, garlic and ginger; stir fry until mushrooms begin to brown, about 8 minutes. Stir in Thai or Chinese sauce: cook and stir until thickened. Transfer fish to a platter; spoon mushroom mixture over and around fish. Spicy Thai Sauce: In a small bowl, whisk together 1/2 cup water, 1/4 cup lime juice, 2 Tbsp. bottled fish sauce, 1 Tbsp. cornstarch, 1 tsp. grated lime zest, and 1/4 to 1/2 tsp. hot pepper flakes. Garnish finished dish with sliced green onions and chopped cilantro, if desired. Chinese Sesame Sauce: In a small bowl, whisk together 1/2 cup water, 1/4 cup soy sauce, 1/4 cup dry sherry, 1 Tbsp. cornstarch, 1 Tbsp. toasted sesame oil, and 2 tsp. rice vinegar. Garnish finished dish with sliced green onions and toasted sesame seeds, if desired. Clean and slice mushrooms, chop onion. Melt 1-1/2 Tbsp. butter and saute mushrooms. Set aside. Melt remaining butter in pan and saute onions until translucent. Add half of mushrooms to onions. Stir flour into mushrooms. Add one can of chicken broth while cooking and stirring until liquid thickens. Stir in remaining broth and water. Boil, reduce heat and cook for 20 minutes. Puree mixture in blender. Return to a sauce pan with reserved mushrooms and add milk, cream, sherry and lemon juice and heat. Add shrimp and cook until pink. 2 ounces oyster mushrooms, shiitakes (caps only), and domestic mushrooms, thinly sliced. Wash and dry greens and trim stems. Break into large pieces and place in bowl with onion slices. In small bowl, whisk together balsamic vinegar, 4 Tbsp. olive oil, salt, and pepper. Heat remaining 2 Tbsp. oil in medium skillet over high heat. Saute mushrooms with salt, just to wilt, about 2 minutes. Remove from heat and sprinkle with lemon juice. Arrange green salad on serving plates. Scatter mushrooms over top and serve. Cut broccoli flowerets into bite sized pieces. Trim stems and slice into 1/4 inch slices. Steam over simmering water until tender but still crisp, 3 to 4 minutes. Plunge into ice water to stop cooking and drain. In large bowl, combine broccoli, mushrooms, and green onions. Mix vinegar with ginger, sugar, salt and pepper. Whisk in oils. Pour over vegetables and toss. Serve immediately. Preheat boiler. Divide sprouts into 4 portions and place in each salad plate. Mix together rice vinegar, soy, and sesame oil and reserve. Coat each mushroom with olive oil. Place on tray and broil 1 minute per side until soft and moist. With tongs transfer 3 mushrooms to each salad, dark side up. Drizzle rice vinegar dressing over all and serve. Place mushrooms in 2 cups lightly salted water in a medium saucepan and bring to a boil. Simmer one minute, then stirring constantly, slowly add grits. Stir until thickened, 5-6 minutes. When grits are thick, remove from heat and add garlic. Add eggs one at a time, beating well after each addition. Add 1/2 cup cheese, red bell peppers, Tabasco, salt and Creole Seasoning and stir to blend. Coat bottom and sides of a 7x7x2-inch casserole dish with olive oil. Pour grits into prepared dish, top with remaining cheese and bake in preheated 300 degree oven 12-15 minutes or until grits are cooked and center is set. In a large skillet saute the shallots in butter for 1 minute. Add the Shiitake mushrooms and cook over medium heat for 2 minutes. Remove mushrooms and set aside. Add the Marsala to the pan and cook over high heat for 1 minute. Add the chicken stock and cook until reduced by half. Add the cream and cook over high heat for 3 minutes or until the sauce is of a creamy consistency. Return the mushrooms to the pan, salt and pepper to taste. In a large sauce pan, saute shallots, garlic and ginger in butter until soft. Add rice an stir until all the grains are coated with butter. Add water, carrots, salt and pepper and mix. Cover and bring to a boil and simmer for 12 minutes. Add the shiitake mushrooms evenly over the rice. Do not stir, but cover and cook 5 - 7 minutes, until rice is tender. Stir in green onions and serve. Saute shiitake mushrooms in 1 1/2 olive oil over medium heat until browned. Set aside. To make dressing, combine sherry vinegar, garlic, salt and pepper and slowly add olive oil. Toss lettuce, beans, carrots and red pepper with dressing to coat. Place on individual plates. Arrange mushrooms on top and add nuts. Saute garlic, onion and Shiitake mushrooms in 2 Tbsp. butter for 3 minutes and let cool. Place chicken on a large piece of tin foil and sprinkle with salt and pepper. Top with mushrooms, then green zucchini, yellow squash, and red pepper. Lightly salt and pepper vegetables. Lay butter pats over the vegetable topped chicken. tightly fold the thin foil to ensure the juices will not leak out. Place on a baking sheet at 425 degrees for 20-25 minutes. Cut off mushroom caps and set aside. Chop stems and combine with green onion and butter. Cover and microwave for 2-2 1/2 minutes. Add mushrooms and heat for 2 minutes. Blend in flour, add beef broth, stir in and stir midway through cooking on high 2 1/2 - 3 minutes until thickened. Stir in half and half. Season to taste. Wipe shiitake caps clean. Slice stems thin and combine with vermouth and water in a pan. Cover and simmer until tender, about 10 minutes. Cut tomatoes in 1/4 inch wide strips and 2 inches long. Slice shiitake caps the same. Heat 2 tbsp. oil in a large skillet. Add garlic, rosemary and 1/4 tsp. salt. Toss for 1 minute over moderate heat. Add stems and liquid, tomatoes and caps; toss gently over medium heat until tomatoes and mushrooms soften and thicken a bit, about 5 minutes. As sauce finishes, boil noodles until just tender and drain. Toss with remaining Tbsp. of oil in a hot pan. Pour in sauce over all. Add salt and pepper, parsley and serve. Beat eggs and milk in a medium sized bowl. Add vegetables and mix. Cook in a skillet as you would an omelet for about 4 minutes, until bottom begins to lightly brown. Flip and slightly scramble. Eggs will remain slightly watery due to the vegetables. Add sliced ham or bacon if desired. Serve immediately. 1 pound shiitake mushroom caps. In a skillet, saute onions and garlic in butter for 1 minute. Add sausage and lower heat to draw fat from sausage. Add mushrooms and saute on higher heat until mushrooms are tender. Salt and pepper to taste. Place olive oil, butter in a large saute pan and slowly cook the onions, for up to 30 minutes, do not brown. Combine mushrooms with 4 cups of water as well as salt, sugar and soy sauce. Bring to a boil and simmer until onions are done. Add onions to the mushroom liquid and simmer another 30 minutes. Preheat oven to 350 degrees, place cheese on the bread and melt. Serve with soup. Trim Shiitake ends off and wipe clean with a damp cloth. Melt a little butter and cooking oil in a skillet. Use a fairly high heat and do not overfill pan with mushrooms, or they will only steam. Add sliced stems and quartered caps, brown lightly and serve. Stir in egg yolk mixed with heavy cream to thicken wine sauce, place on toast. Place dried mushrooms and kelp in a large pot of cold water. Bring to rapid boil, discard kelp and reduce heat to a simmer. Cook stock uncovered for 15 minutes. Break off and discard the heads of dried sardines and add bodies to the pot, cook another 10 minutes. Strain stock through a cloth lined colander, discard mushrooms and fish. Season dark broth with soy sauce, sugar and sake. Serve with noodles. For dressing, mince the parsley in a food processor or by hand. Add the oil, vinegar, mustard, tarragon, salt and mix well. For salad, cut green onions, including the green tops into thin rings. Cut red pepper into 1/4 inch dice. Cut mushrooms into thin slices by hand or in food processor. Combine water and bullion cubes in heavy sauce pan, bring to a boil. Stir in the rice and bring to a boil once again. Lower heat, cover and simmer until water is absorbed, about 45 minutes. Let rice cool to room temperature. Trim off tough Shiitake stems and slice tops into narrow strips. Heat non-stick skillet and combine the wild and white mushrooms. Cover and sweat them over moderate heat until just wilted. Combine in a large mixing bowl with rice, carrot, parsley, chives, walnuts and vinaigrette. Add salt and pepper. Cover and marinate 2 hours or so. Combine in a cruet or bottle with tight fitting lid and shake well. Shake again before each use. Makes 1 cup. 1 pkg. (1.25 oz.) Forest Dried Shiitake Mushrooms, rehydrate as directed. Combine all ingredients except cornstarch in a saucepan and bring to a boil. Lower heat and let simmer for 1/2 hour. The liquid should be cooked down to 2 cups. Thicken with cornstarch mixture. Serve and enjoy. Heat oil in large pan or Dutch oven. Add garlic, eggplant and mushrooms and saute until vegetables are golden, 5 to 10 minutes, stirring occasionally. Set aside. Clean hens, brown bacon in pan and remove bacon slices. Add hens to bacon fat and brown on all sides. Remove hens and pour off fat. Add paprika and stir over low heat for 1 to 2 minutes. Add white wine and scrape up browned bits off bottom. Add chicken broth, thyme, salt and pepper. Simmer 2 to 3 minutes. Add hens, vegetables and baste with pan juices. Bake on 350, uncovered until hens and vegetables are tender, about 1 hour. Remove hens, eggplant and mushrooms to serving dish. Add Madeira to pan. Cook uncovered over high until liquid is reduced by 1/4. Pour sauce over hens and vegetables, crumble bacon over dish. In a large pot, bring broth to a simmer and add chicken, ginger and bamboo shoots. Stir tofu into the soup. Slice Shiitake and add with Oyster mushrooms to broth. Add half the Enoki mushrooms and chopped green vegetables. Dissolve cornstarch in water and slowly stir into the soup. Remove from heat adding the egg, soy sauce, vinegar, sesame oil and seasonings. Top with remaining Enoki mushrooms. Peel and dice shallots and place in pan with sliced mushrooms, adding 1/2 cup wine heat to boil and evaporate all liquid. Add heavy cream and thyme, then cracked black pepper. Simmer until liquid is reduced by half. Refrigerate for 3 hours, or until cream solidifies. Lay puff pastry squares on table and place 1 tsp. of mushroom filling in the center of each. Brush edges with egg and fold to form triangle. Seal by pressing edges with fork. Then brush entire surface with egg. Bake at 425 degrees until golden brown, about 8 to 10 minutes. Heat remaining mushroom cream sauce and pour equal amounts on to each plate. Top with parsley.